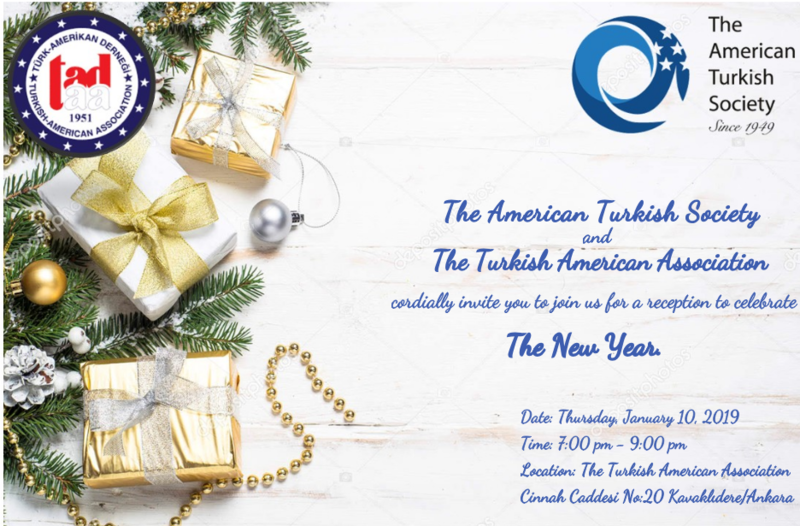 On Thursday, January 10, 2019, The American Turkish Society (ATS) organized its annual new year’s reception with The Turkish American Association (TAA) at TAA’s headquarters in Ankara, Turkey. When delivering welcoming remarks, Chairman of TAA, Ali Kemaloglu and Executive Director of ATS, Janset Batibay launched “The Promising Turks” fund, a mutual fund established by both organizations. Many people attended representing various industries from business, art, non profit and government, celebrated the new year and learned more about the fund. What is the Promising Turks Fund? For years, both TAA and ATS have been awarding scholarships to help successful Turkish students to study in the U.S. or learn English in Turkey. However, both organizations have observed over the years that, in addition to scholarships, there are also many young, bright and promising Turkish students at high school, college, masters and PhD levels, who do not need scholarships, but instead have been invited by universities in the USA and need funding in accommodation and for transportation to help them present their findings or scientific research at competitions, symposiums or conferences organized by prestigious U.S. educational institutions or NGOs. Both organizations believe that these students are the Promising Turks that will contribute in promoting a better understanding between U.S. and Turkey and improving cross-cultural dialogue. Who can benefit from the fund? All Turkish students and student teams/groups (highschool, masters and Phd levels) who will represent Turkey in the US in the field of STEAM (Science, Technology, Engineering, Art and Math) and International Relations, will be eligible to apply to the fund. How can you support the fund? Each year, TAA and ATS will determine a budget to fund the “Promising Turks Fund.” However, the fund is also open to individual (in condition that it be at least 100 USD) and corporate donations. Your support is critical to ensure that more Turkish students represent Turkey in the USA.